The Chair's Invitational Dinner is now in its fourth year, the previous dinners sold out quickly and 100% of attendees surveyed indicated that they would attend again. 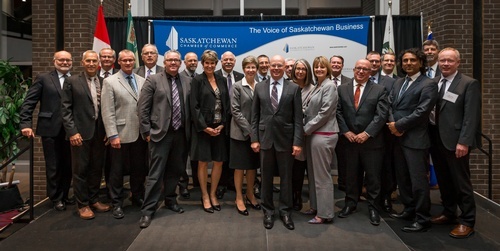 This unique event serves as a connector between Deputy Ministers, Crown Presidents and the Saskatchewan Chamber of Commerce Board and members. The Chair's Invitational Dinner will feature an incredible menu of Saskatchewan foods as well as a premium selection of wines and spirits. The conversations will be energetic and informed, with a Deputy Minister or Crown President as a guest at each table. The Chair's Invitational Dinner is an event not to be missed for business leaders interested in the future growth of this province. $175.00 plus tax.Cancelations are refundable in full until November 19, 2018. After this date cancelations are non-refundable. Registrations are transferable at any time.